Pune cricket stadium is the international cricket stadium located in Gahunje locality of Pune, India. It is an international cricket ground capable of holding day and night matches due to the availability of flood lights. The official name of the stadium is Maharashtra Cricket Association Stadium and it is a newly built stadium. It was established in the year 2012 and it is international cricket ground after the world-renowned Wankhede stadium of Mumbai. It is architected by Hopkins Architects and Maharashtra Cricket Association is the owner of this stadium. It is operated by Pune Stadium Ltd. This stadium is hosted few international matches along with many IPL matches of Indian Premier League. This stadium was the home ground of Pune Supergiants for last two season (2016 and 2017). This stadium is again in the limelight as Chennai Super Kings matches are scheduled to play at Gahunje Stadium Pune along with one eliminator and qualifier 2 of IPL 2018. This stadium is also famous as the name of Sahara Stadium Pune. At the time of IPL schedule announcement IPL organizing committee awarded two important matches to Pune stadium. 23 May match and 26 May Qualifier 2 match are scheduled to held at Maharashtra Cricket Association stadium. After the protest over Cauvery river water, many protesters gave warning to CSK team owners to abort the matches at Chepauk Stadium Chennai. After many internal meeting with different agencies and owners of CSK, IPL organizing committee has decided to move Chennai home ground matches to Pune stadium. Earlier four cities were in the line, however, in the end, Pune got the matches. It is Pune turn to watch the live matches in the stadium. In last two seasons, they cheer their Home team RPS, in this season they will cheer the CSK in their home ground. CSK is the most popular team of IPL and most of the Chennai fans are very sad after hearing the news of venue shifting. They waited around three years to watch CSK matches live in M A Chidambaram Stadium Chennai. Below is the schedule of Chennai Super Kings Home matches schedule of Pune Sahara stadium. Now CSK home matches will be played as per above schedule. We are waiting for official announcement on IPL T20 official website. Pune stadium IPL tickets are expected to sell online through bookmyshow website and app. Qualifier and Eliminator matches will come on sale very soon. Pune CSK IPL tickets schedule will be out in few days. Sale of Chennai CSK matches are on hold after the shifting venue to Chennai. Gahunje stadium IPL tickets are expected to sell through online mode along with Pune stadium ticket counters along with the retail outlets throughout the city. Online mode is the best way to book Pune stadium IPL tickets online in few clicks. We are sharing the complete process to book Pune IPL tickets online. Log on to Tickets booking site and select city to Pune (Bookmyshow). After selecting the city, look for IPL tickets and click on book now button. On IPL tickets page look for available match tickets and select the desired match. On match page, select the available seats as per your budget from the virtual layout of the stadium. After selecting the tickets, payment is necessary to complete the transactions in online mode. After the payments, e-tickets will be sent by the ticketing site to registered mail ID and a confirmation message will also be sent to the registered mobile number will all the instructions. E-tickets are not valid for entry in the stadium and these tickets must be exchanged with original entry passes to get entry inside the stadium. Visitors are also advised to read all the terms and conditions written on tickets booking website before purchasing CSK IPL tickets of Pune stadium. Some tickets of Pune stadium are also expected to sell through offline channels, so that maximum number of ticket fans can buy these tickets. Pune stadium ticket counters might sell CSK IPL tickets along with the qualifier and eliminator IPL match tickets. Some authorized retail outlets might also sell the tickets. We are advising our users to buy CSK IPL tickets of Pune stadium only from official sources only. Pune stadium IPL ticket prices are not announced till now, we are hoping that tickets prices of this stadium will be little cheaper as compared to Chepauk Stadium Chennai. Update ticket prices will be published after the official announcement. 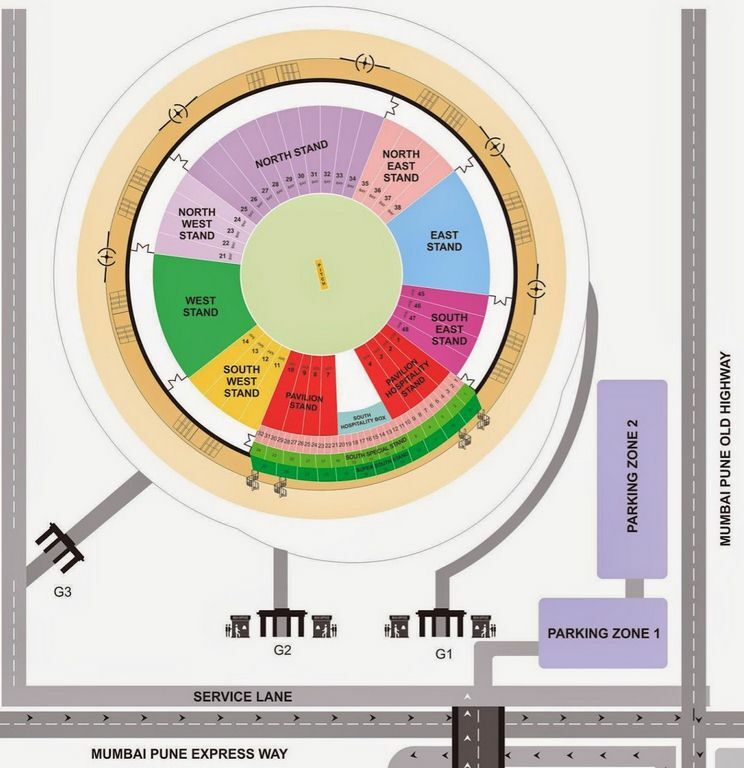 We have shared the Pune stadium layout for the convenience of the visitors who are planning to watch live IPL match in the stadium. This map is also helpful to those who want to book tickets with full planning and select seats. All the stands are clearly depicted on the map along with entry gates. Nearby roads, parking lot, pitch position, stand, also displayed on the map. Seating arrangements are also shown on the map to know about the seating position or find the seat before the beginning of the match. Stadium gates are opens three hours before the match, therefore visitors are advised to reach the stadium in time. I hope this post will help you to book Pune CSK IPL tickets easily.